Do you love a wedding? We know we do! We don't just see looking after your wedding as a job, it is a privilege. Based in Bournemouth and celebrating our 25th year - it goes without saying that we have been involved in rather a few weddings! So you'll benefit from our in-depth knowledge, expertise and close knit friendly team who cannot wait to assist you, and be part of your very special day. Personal service is guaranteed in this warm and relaxed family run business. We are a one stop shop for weddings, where nothing is too much trouble. But, we aim to be more than just a wedding shop - to offer advice, to be honest and, to be a friend. To use our experience and expertise to help you our customers choose the wedding you want - your way - within your budget. Because we care, we get it right! Gill and her friendly staff are available to help you plan “the big day”. We encourage you to make an appointment so that we can provide you with a more personal service and give you the time needed. Nothing is too small for our attention. Nothing left to chance, nothing forgotten. All Aspects Wedding Services can give you the complete service to make your wedding perfect. We know when to advise and when to listen, simply guiding you through the maze of decision-making, step by step. 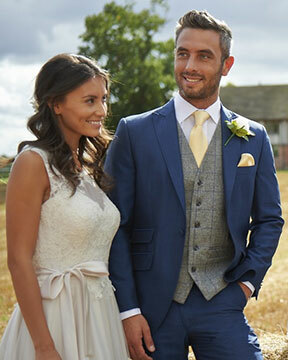 Should you want us to, we can arrange every detail from your bridal gown & bridesmaid dresses, belts, veils, tiaras, men's suit hire, to wedding car hire, and we will even come and dress you on the day. Please have a look at our Bridal Gowns, Bridesmaid & Prom Dresses, Men's Hire Department, Wedding Cars, Dressing Service, Awards, Promotions, Accessories and Testimonials sections whilst you are here. 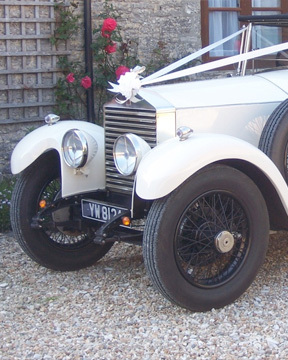 We are the proud owners of Superwed Cars... where we have on offer a fantastic range of classic, vintage, modern and the more unusual bridal car. 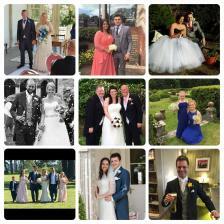 We just wanted to say a very big thank you for all your help with finding the Perfect Suits and Bridesmaids dresses for our Big Day. Nothing was too much trouble and you gave us exactly what we wanted. You made the whole experience wonderful. Thank you for putting up with us all. We will certainly be recommending you to all our friends. Thank you so much Gill, you were amazing in all that you have done to put everything together for me & Jay, the bridesmaids, the flowergirls and the suits were fantastic. We had the most wonderful day with our loved ones and family. 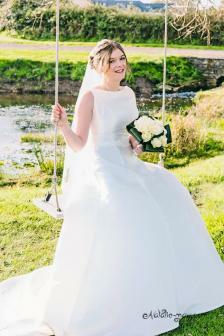 The dress I got from all aspects was simply beautiful and the service I received was fantastic! They helped make my day unforgettable. What a stunning photograph! 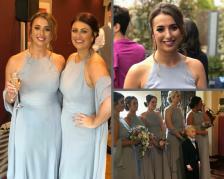 All of Maxine's bridesmaids look absolutely beautiful in their Dessy dresses in the colour 'Oyster'. 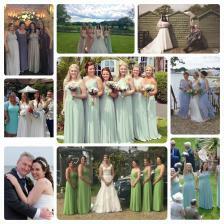 Great photos here of all of Zoe's bridesmaids, all looking beautiful wearing Dessy dresses in the colour 'Platinum'. The colour combinations are gorgeous! 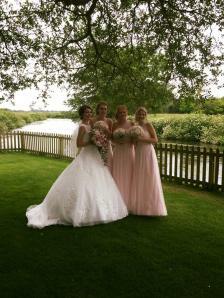 What a lovely photograph of the beautiful bride Charlotte and her three bridesmaids. Glad everybody had such a wonderful day. Gill and the team are simply amazing. They know there trade extremely well and make you feel comfortable, special and most importantly find your perfect dress for your big day. From trying out dresses to final fittings, the whole experience was enjoyable and easy. I received so many compliments one my dress and cannot thank the team enough for everything. 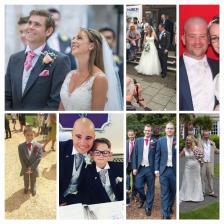 Some great photos here of Mr and Mrs Dibden's wedding day! The guys all looked wonderful in their suits. Love these photos! Thank you Gill for your professional but friendly service. We had a fab wedding day and loved the dresses. So lovely to see so many smiling faces! I was starting to worry I would never find dresses in the style and colour I wanted, had exhausted all highstreet shops and found other bridal retailers very frustrating. When I wanted a red wine colour they kept offering me pink. "It's merlot!" they claimed, but I don't care what the label says, they were pink. Gill at All Aspects took us in without an appointment, listened to and understood exactly what I wanted, then gave me and my bridesmaids about 10 books to browse through, filled with bridesmaid dresses, almost all available in the colour I wanted. In addition, all the the styles were available to try on that day. I had told my bridesmaids they could have any dress they liked so long as it was the same colour, but they settled on the exact same dress. Perfect! Happy bridesmaids, happy bride. The fitting service was great too, and we were probably slightly awkward customers with some last minute indecision on shoes. Gill oozes in knowledge and experience, and I only wish I had gone to All Aspects first and saved myself a lot of hassle and worry. Thank you All Aspects. 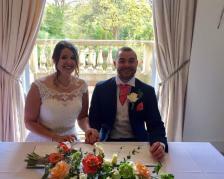 A beautiful photo of our lovely bride Sue and her groom. Enjoy married life together! 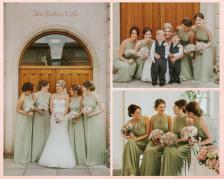 I can’t thank Gill enough for helping my sisters find their perfect bridesmaid dresses. All Aspects have a huge range of dresses that suit everyone. 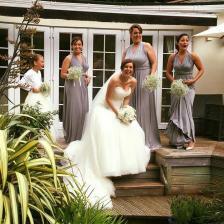 The alterations were perfect and they looked stunning on the day! I first went to see Gill for my dress, she made me feel at ease and gives great advice, which stayed with me throughout the whole process. 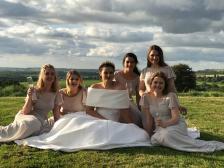 I then went to All aspects for guidance with bridesmaid dresses, well this was the most stressful part of the wedding! Gill sorted everything, she organised the bridesmaids, helped pick styles to suit all of the girls and took away the stress, this continued when we came across issues with the colour of the dresses, one call to the shop and it's like they have a magic wand, we were in with Gill and she was resolving the issue. The teams Customer services can not be faulted. 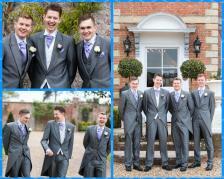 Their next mission was to sort out the groomsmen, that was something I wouldn't wish on anyone!!!! The boys were treated lovely and with a professional attitude but Gill was not going to take any of their grief, for once they did as they were told, whilst having a giggle. I love that about All Aspects they listened to my Husband and I (well mainly to me) and our vision of styles and colours were brought together, with guidance and the patience of a saint. I felt like the craziest, fussiest bridezilla until Gill and the girls stepped in and were able to reassure me, I can honestly say they were A god send and I can not recommend them enough, I didn't feel like a customer, you become part of a family and your needs and requirements are given 100% all of the time! I would pick Gill and her team over and over again! 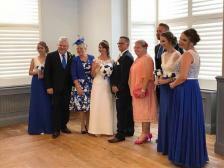 Thank you to Gill and All Aspects team for everything you did for our wedding, everyone looked and felt amazing. Just a note to say thank you for all your help with the wedding. 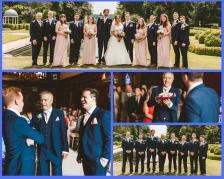 The guys looked resplendant in their suits which fitted beautifully and Ellen looked gorgeous in her dress. The cars looked great and it was lovely to see you both on the day. Thanks to Jude and Sam for the alterations. Must catch up soon. Where do I start... like every bride to be I was stressing over everything and was dreading dress shopping. I booked my appointment and from the moment I stepped into the shop I knew I didn't have to worry about my dress anymore, Gill and her team were amazing, the choice of dresses were amazing I had a style in mind but ended up with a completely different style.The choice of dresses was amazing both for me and my bridesmaids. I couldn't get all my bridesmaids together on one date but that wasn't an issue for Gill and her team I even had to get dresses shipped to a couple of them so they could try them before the wedding, this was made easier by Gill all I had to do was sort out the courier and Gill did the rest. The professionalism of the team was unbelievable. Like every bride I was worrying my dress wasn't going to fit cause I was losing weight but with the dress fitting my dress fitted beautifully. I had a separate dress for the evening which I had brought online, gill and the team did the alterations for that dress to (tho I didn't end up changing). Between choosing my dress and bridesmaid dress and the fittings Gill was always on hand for any questions or queries I had and nothing was to much for her!! Even after the wedding when I sent my Dress back to them to be clean and boxed they couldn't do enough for me!! It's two years this year since I've got married and till this day I'm grateful for all the help Gill and her team gave me leading up to the wedding.... I would totally recommend this amazing team to anyone getting married!!!! Thanks Gill!!!!!!! The bride looked stunning! Thank you for all the kindness, courtesy (and patience) shown to Caroline and her mum! The service that you provided at every stage was absolutely exemplary. 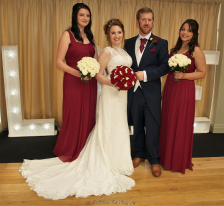 You helped and guided us when ordering of stationery, you provided me with the most beautiful wedding gown, the bridesmaids dresses were exquisite and the grooms suit, along with groomsmen's suits were exactly what we wanted. You supported us every single step of the way, you were incredibly patient and flexible. Thank you for allowing me to come in many times and try on my dress in my bid to slim down for the wedding. 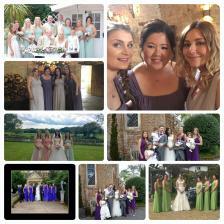 Thank you for all the help in sourcing the right colours, the right styles and organising such a wonderful seamstress. 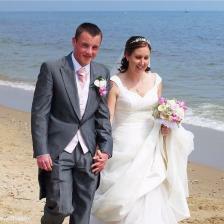 We would recommend you to anyone for any aspect of their wedding planning. Your range is wonderful, fairly priced and great quality!